With the World Cup happening presently in Brazil, what better way of celebrating the tournament not with the latest incarnation from Electronic Arts, but with Kunio-ken characters representing 13 different countries fighting your way to the top. Kunio-ken characters I hear you ask? Well, back in the early days of the NES a company by the name of Technos Japan created a series of games for the NES that featured similar types of characters in different types of games, such as River City Ransom, Super dodge Ball and one that might be familiar to gamers, Double Dragon. So with that in mind, rather than controlling the likes of James Rodriguez and Neymar, you’re instead controlling characters such as John, Kunio and many more. So how does it fare up, is it as good as Goal! or does it make you wishing you was on the first flight home? Nintendo World Cup is a football (that’s right, not Soccer) game where you control one character with the d-pad but partially control the rest of the team by pressing the A or B button to command the player and request an action, such as tackle or shoot. Score more than the other country then you progress. If not, well, it’s game over. It really is nothing more complicated then that – it’s football (not soccer) so how complicated is that? So when you start the game up you get to choose whether to start the tournament mode with 1 or 2 players, or if you don’t have the time nor inclination to do a full tournament then you can have a one off match with up to 4 players. Yes that’s right, you can grab your Four-Score out and have four people play a football match which is always a good social event. It’s common with football (NOT SOCCER!) games to have four players on screen, maybe even more and signing into profiles and all that nonsense, but Nintendo World Cup offered the chance for four players on one console to play a match. It certainly beats a four player match of anticipation. So you choose the country you want to be, which disappointingly doesn’t include the USSR but does include West Germany so it’s not all bad. You then choose which players from your team play in which position, and also what strategy your team will use in 4 quadrants. You know s*it gets serious when you decide strategies in “quadrants”. After that, the match kicks off. 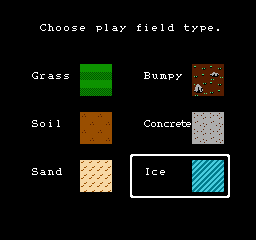 Play on Ice? How reckless! How naughty! As mentioned above, you control one character as you would with any football match, moving him over the pitch and pressing the A button to pass the ball, or shoulder barge if you don’t have the ball and the B button shoots, and slide tackles when you don’t have the ball. Football games do not need to be complicated like they seem nowadays, and Nintendo World Cup is a great example of this. Pirouetting with the ball and doing rainbow flicks may be OK for some, but for a good football gaming experience, it wasn’t needed in NWC and it benefited from this. If one of your team members has the ball, you can command that they pass the ball, or shoot or tackle using the same A and B button commands for when you do have the ball. It is good when your halfway down the field, and you press the A button to pass, and your team mate launches the ball to your head. Finally, you can press the A+B button together to do a special shot or header which can help decide a match, and is useful to have up your sleeve (or shorts) in later rounds when the computer gets more difficult. 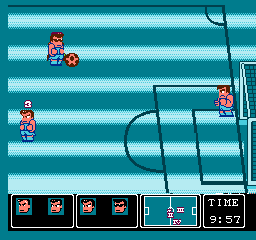 Nintendo World Cup is a worthy sports game on the console, and with the Kunio-ken characters it makes for a unique game on a common game theme. The best comparison to make is with the Mario games that deviate away from the usual platforming fare and have Golf, Tennis, Charged Football games, where the series deviates into other genres, this is the same for NWC. 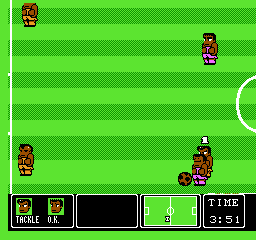 The graphics are simplistic yet bold and who doesn’t enjoy having four players on one football match? Even if you don’t have four players to hand, if you got another person you can both play in the Tournament mode, and with 13 different teams there’s always something different whenever you play. Add into this mix is the number of strategies you can employ and the different players in different positions, and you get a cake, or game that results in one worthy of being in any collection. 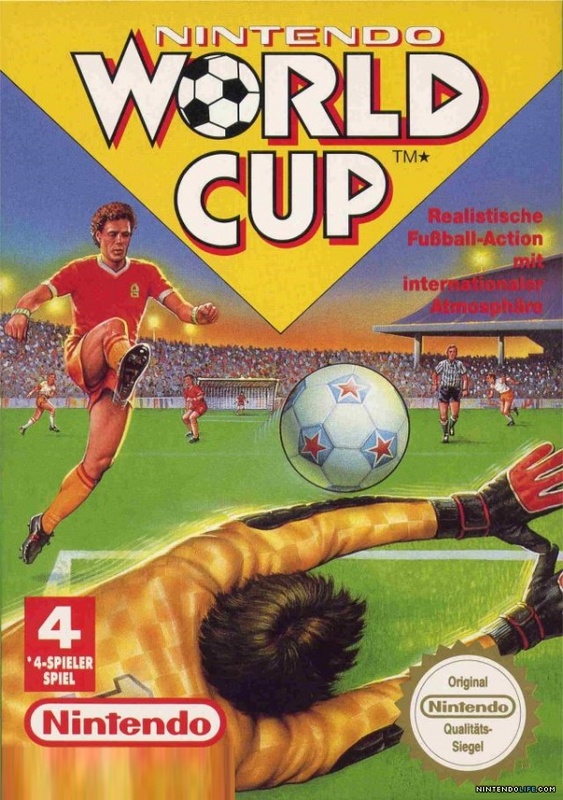 The game is common to get from your local gaming store and online auctioneer so this summer, with England currently on a rowing boat back to the UK then grab a copy, grab some friends, throw that copy of Anticipation away and prophesize the final of the world cup and be West Germany!